Dutch genre artist during the Baroque period Jan Havickszoon Steen was born in 1626 in Leiden. His affluent family were brewers. He was part of the Dutch Golden Age in the 17th century. He was well-known for his use of abundant colors, his humor and his psychological insight. His family ran The Red Halbert tavern for two generations. The eldest of eight children, Steen, just like his contemporary Rembrandt van Rijn, attended Latin school in Leiden. He studied art in Utrecht from German painter Nicolaes Knupfer who specialized in figurative and historical scenes. 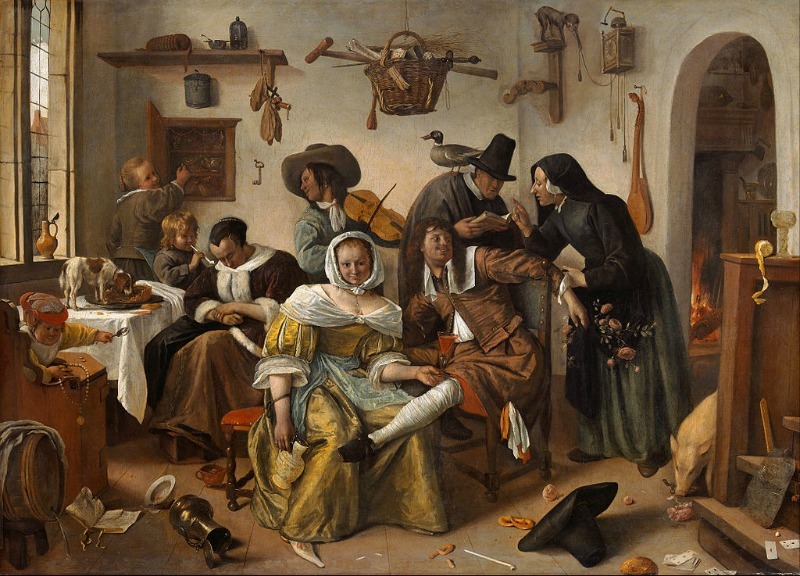 Jan Steen’s employment of colors and his composition were clearly influenced by his art teacher. Haarlem rural scene artists Isaac van Ostade and Adriaen van Ostade also influenced Steen although it was not known if he also received painting lessons from them. The van Ostade brothers were pupils of famous Dutch portrait artist Frans Hals. Jan Steen and fellow Baroque artist Gabriël Metsu, who was also from Leiden, founded the Guild of Saint Luke in 1648. Metsu was known for his delicately beautiful genre works, portraits, still lifes and history paintings. Jan Steen later became an assistant to famous Dutch landscape artist, Jan van Goyen, who became Steen’s father-in-law in 1649. He remained his father-in-law’s assistant for five years before he moved to Delft to manage the De Slang brewery for three years, although it was not a success. The art market did not do well either, mainly due to the massive firecracker explosion in 1654 that destroyed most of the city. Jan Steen managed to paint “A Burgomaster of Delft and His Daughter” though. Although Jan Steen did not earn much from his art, among Dutch painters of his time, he was the humorist. This fact made him unique among the leading Dutch painters of the 17th century. He was even productive, creating close to eight hundred paintings, most of them witty with underlying moral messages. His humor was often compared to his contemporary, Molière, who was a French comic playwright. 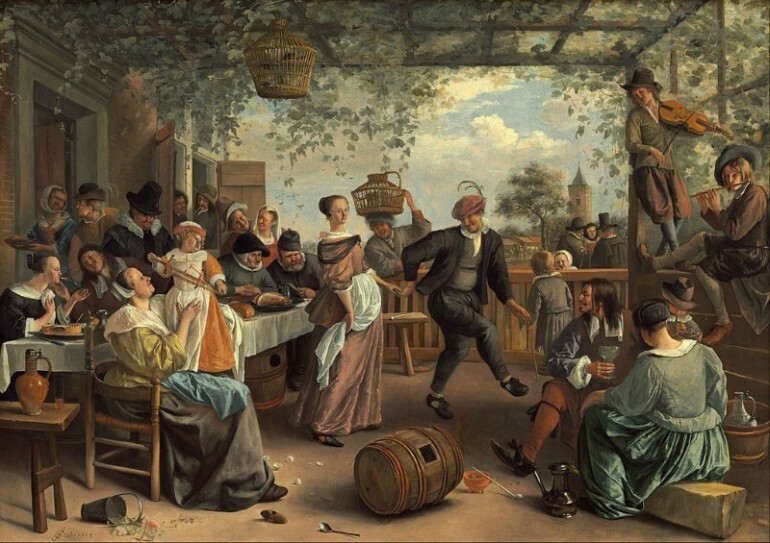 Jan Steen was famous for his animated, warm hearted and humorous genre scenes, showing his keen insight to portray life as an immense comedy of manners, although he was also known to work on religious subjects, as well as mythological and historical themes. He also did portraits, birds and animals. His paintings of children were unsurpassed, with his ability to capture their subtle facial expressions and his still lifes could rival those done by specialists in the genre. In his native country, he ranked on the same level with Frans Hals and Jan Vermeer. He was versatile. His works showed inventive composition and rich characterization. He was attentive to details. He was also a master in rendering light and texture. He was a skilled colorist and was distinguished for his remarkable handling of difficult colors such as blue green, salmon red, pale yellow and rose. It was often said that Jan Steen had a strong relationship with the Rederijkers or Rhetoricians and the theater. His uncle was a Rhetorician and there were several paintings that Steen created that portrayed the lives of the Rederijkers, such as the “Rhetoricians at a Window 1662-66” that now belongs to the Philadelphia Museum of Art in the U.S. He also made portraits of Rhetoricians that are in the Worcester Art Museum in Massachusetts and Musées Royaux des Beaux-Arts in Brussels. Even his painting “Anthony and Cleopatra” that hangs at the Kunstsammlung der Universität, Göttingen in Germany is said to be theater-inspired. The main theme of most of his paintings were scenes from daily life, most of them lively and lustful. Due to this, the Dutch proverb “a Jan Steen household” or “een huishouden van Jan Steen” was born. It meant a messy scene. Actually, most of his paintings referred to Dutch literature and proverbs of old. About 350 of his more than 800 painting still survive. Steen only dated a few of his paintings. He also varied his style frequently. His religious paintings, about 60 of them, reflected his Catholic faith. However, he treated his religious paintings as incidents in Holland during the 17th century. He also did not hold back on the humor, despite the religious theme. His landscapes, including the winter scenes, showed the influence of the van Ostade brothers in the small earthy figures included in the paintings, which later got bigger and characterized individually, such as in “Skittle Players Outside an Inn” at the National Gallery in London. At a late stage in his career, his paintings began to show the coming of the Rococo style that matured in the 18th century. This was shown in his paintings such as the “Serenade” that is at the Národní Galerie in Prague. This painting showed more flamboyance and French influence. Although there were no known pupils who studied under Jan Steen, many of his works were imitated to a great degree. He also became a huge source of inspiration to numerous artists.